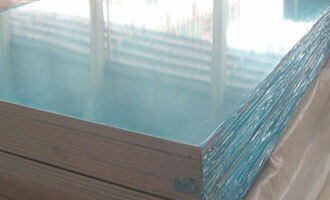 What is the anodized aluminum sheet? Anodized aluminum plate is to place the Aluminum Plate in corresponding electrolyte (such as sulfuric acid, chromic acid, oxalic acid, etc.) as the anode for electrolysis under specific conditions with externally applied current. The Aluminum Plate of the anode is oxidized and has an aluminum oxide film formed on the surface; the film is 5-20μm thick, and a hard anodic oxidation film can be up to 60-200μm thick. After anodization, the aluminum plate achieves greater hardness, better abrasive resistance (up to 250-500 kg/mm2), and good resistance to heat; the hard anodic oxidation film also features a melting point of up to 2320 K, excellent insulativity, high breakdown voltage (up to 2000V), and enhanced resistance to corrosion (it may stand salt spray under ω=0.03NaCl for thousands of hours without being corroded). Additionally, the oxide film is distributed with numerous pores that can absorb various lubricants, thus making the anodised aluminum plate suitable for manufacturing engine cylinder or other wear-resistant parts; the strong absorbability of the film can also be well utilized to form various bright colors. (1) Good processability: the anodised aluminum plate is strongly decorative, featuring moderate hardness and easy bending and shaping; it can be processed by continuous pressing at high speeds, and directly made into products without requiring complex surface treatment, thus having greatly reduced the production period and the production cost of products. (2) Good weatherability: an anodised aluminum plate with oxide film of standard thickness (3μm) stands colorfast for a long time when it is used indoors, with no corrosion, oxidation or rusting; a thickened anodised aluminum plate (thickness of 10μm) can be used outdoors with colorfastness under long-time exposure to sunlight. (3) Prominent metallic features: anodised aluminum plate may have their hardness on a par with gems and are well resistant to scratches; they have no paint coating on the surface and thus have retained the metallic gloss of aluminum sheets, protruding the modern metallic features and promoting the class and added value of the products. (4) Good resistance to fire: as the anodised aluminum plate is purely made of metal without any paint or chemical substance, it neither combusts at a temperature as high as 600 degrees, nor generates any poisonous gas, and thus satisfies the requirements for environmental protection. (5) Good resistance to dirt: the anodised aluminum plate retains no finger print, and thus no stains will be left; it can also be easily cleaned, without producing any corroded spot. (6) Wide applicability: the anodised aluminum plate is widely used, and applicable to metal aluminum ceiling, curtain wall plate, aluminum composite panel, fireproof board, honeycomb aluminum panel, single aluminum sheet, electric appliance panel, cabinet panel, furniture panel, etc. The anodised aluminum plate are widely used in such fields as mechanical parts, airplane and automobile parts, precise instruments, wireless electrical appliances, building decorations, mechanical housing, illumination lamps, electronic consumables, art wares, household appliances, indoor decorations, sign boards, furniture automobile decorations, etc. Anodized aluminium sheet plate is widely used in machinery parts, aircraft auto parts, precision instruments and radio equipment, architectural decoration, machine shell, lighting lamps, electronic consumer goods, handicrafts, household appliances, interior decoration, signs, furniture, car decoration and other industries.